The water of the Gulf of Oman is smooth tonight. It flows like molten black glass under a star-lit sky... a liquid prism refracting the neon sign of the Candle Cafe into a hundred pieces of light, each gurgling effortlessly toward the beach. In the distance, the muezzin at the Mosque just outside the Hyatt hotel starts his plaintive call to prayer. Strains of "Allaahu akhbar..." waft over the lapping waves as mosques to the left and right join in the call. Above, a jet streaks by, headed for Seeb International. A distant cheer goes up in front of the flickering football game projected on the wall of the Candle. And then it's quiet again... until a school of fish splash out of the water to my left before vanishing into the dark. Tomorrow I get on a plane headed for my family and "home" in the US. Tonight though, I'm floating... not just on the salty waters of the gulf, but on the memories of our three years here in Oman. Click here to continue... Memories of the sun setting slowly behind layers of blue-tinted mountains. Of a herd of camels roaming the green hills of Salalah. A school of dolphins frolicking in the wake of our Dhow in the Fjords of Musandum. Camping on the high plateau of Jebal Akhdar - so close to sky we could almost touch the stars. Exploring the depths of Oman's water wonderlands - petting an eel, staring down a leopard shark, and delighting in the artistry of a ray flying gracefully over purple coral gardens. Descending a rope 500 feet into the underground majesty of the Majlis al Jinn. Roasting marshmallows over the campfire on a private beach far away from the rest of the world. Memories of bullfights, camel rides, sand surfing and dune driving. The warmth of Omani hospitality around a shared meal. Singing Christmas carols and stoking a bonfire on a rocky plain outside of town. A sea turtle scrabbling her way back to the surf after laying her eggs in the weak light of the dawn over Ras al Hamra. Danna... learning to roll, sit, stand, walk, run, babble, talk and orate. Jad "washing" dishes with Abby, defeating a horde of evil pirates with Aiden, or polishing his ballet moves with Nadia and Ashley. Three short years... but years long in memories! So we're off! Officially! To new adventures in the Czech Republic. Erin, Jad and Danna left first, heading to Oklahoma, our home base this summer, on the first of May. In the midst of flying half-way around the world, moving, buying a house, and growing a baby, a new challenge came our way almost as soon as they touched down in the US. Danna was diagnosed with pediatric Nephrotic Syndrome. For a while, she looked a little like the pillsbury doughgirl, but a combination of good medical care, your prayers and steroids seem to have helped her turn the corner. She has lost over 5 pounds in water weight in the last two weeks, and is back to being our cheerful little girl, both indications that are very positive. They'll all been busy reaquainting themselves with the wonders of life in the US - taking in everything from the "annual Chuck Wagon Gathering and Children's Cowboy Festival at the National Cowboy and Western Heritage Museum" (what a mouthful) to the annual "Kolache Festival" in... get this... Prague, Oklahoma! Surrounded by friends and lots of family, they've been having more fun than they know what to do with. Moving to internal matters, reports continue to be good from within the ever-expanding regions of Erin's belly. "Baby Waby" is scheduled to make his first appearance in mid-July. Meanwhile, I've been busy in Muscat packing up our house, selling one of our vehicles, and saying lots of goodbye's. I'll be in Washington DC for most of June, with a brief weekend visit to Oklahoma before returning there for the rest of the summer around the end of June. Unfortunately for all you west coasters, we won't be able to make it to Portland this time around. If you've ever wanted to visit the Red Dirt state, though, this would be the time to do it. Our home number in OK is 405-340-1983. Give us a call and come on over! Are you in DC? I'd love to see you - I'll be there until June 23rd - send me an email! If things hold per our current schedule, we're due in Prague on September 1st to start a new three-year adventure - this time among the castles, forests and cobblestoned streets of the Czech Republic. Kevin, for the rest of the "Travelling Rubeshes"
Ahhh...the advantages of being in Oklahoma in May! That means being able to attend the annual Chuck Wagon Gathering and Children's Cowboy Festival at the National Cowboy and Western Heritage Museum. To say that Jad and Danna were excited about this would be such an understatement!!! Jad definitely dressed the part since he has cowboy attire. Danna doesn't have any cowgirl clothes, but that didn't stop her from imagining that she was Cowgirl Alicia on her horse named Blueberry. Loaded with lassos, it was time to ride a pony!! What a thrill! Christopher accompanied Cowboy Jad and Uncle Michael was with Cowgirl Danna (aka Alicia). Next, it was time to rope a steer!! Yes siree, both Rubesh cowhands took a turn roping some cattle! By now, it is time to visit some horses and feed them some hay. Since the horses wouldn't mosey on over to our side of the corral, Christopher took Jad and Danna over to the horses and taught them the proper way to give a treat to a horse -- palm open and flat!! A children's author read her "Cowboy Camp" book which was so good that we had to buy a copy! As you can tell, Jad and Danna were thoroughly engrossed in the story! After the story, she did a little bit of a magic trick and when she asked the kids for a good cowboy magic phrase, Danna blurted out "Yee haw!! "And that was just the phrase she needed to finish off the magic trick! The kids also did a cowboy craft with this talented Cowgirl Author. We were getting hungry from all of this activity, so we found some cowboy beans and chuck wagon stew to appease our appetites. Dessert was homemade peach cobbler that was absolutely delicious!! All of the food was made outside over open fires using the ingredients and utensils from 100 years ago. It was rather impressive and very tasty! We followed up lunch with a quick game of horseshoes. Then it was time to check out the museum. The National Cowboy and Western Heritage Museum was very nicely done, however I didn't get to read one single plaque since Jad and Danna raced through each room touching as many things as they could. I did get a shot of Cowgirl Danna on a saddle though! 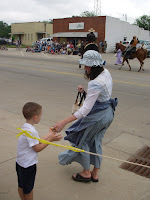 If you happen to be in the Oklahoma City area during a Memorial Day weekend, be sure to check out the wonderful annual Chuck Wagon Gathering and Children's Cowboy Festival at the National Cowboy and Western Heritage Museum! Yes, believe it or not, there is a Prague, Oklahoma! Some of the initial residents came from Czechoslovakia many, many moons ago. In honor of their heritage, they host the annual Kolache Festival. (Kolaches are a sweet pastry famous in the Czech Republic.) What better way to enjoy a weekend in Oklahoma AND prepare us for our upcoming move to Europe!! The festivities began with a parade -- the kind where the parade watchers (us) receive candy and sweets from the parade participants. Jad and Danna loved picking up the candy that was thrown at them! 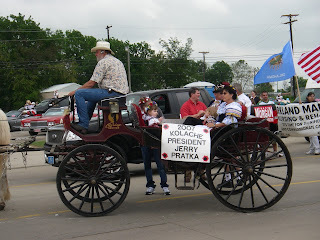 The parade itself was a mixture of Oklahoma heritage and Czech outfits. 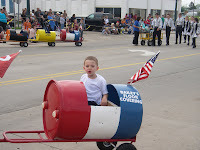 Jad enjoyed riding in a home-made train during part of the parade. (Danna was content to be held by her big cousin Christopher.) John Deere tractors made an appearance, as well as the local Harley Davidson chapter. 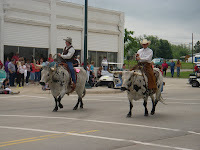 We saw many, many cowboys on horseback, but an all-time new experience (for me, at least) was seeing cowboys ride steers! 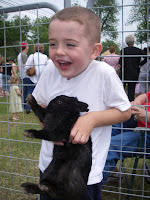 And no rural festival would be complete without a petting zoo. There were 5 black piglets, who were faster than lightening and seemed to weigh a ton! 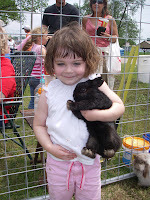 Also in the petting area were some gentle baby goats, but my two youngsters enjoyed the rabbits best of all! For me, the highlight was meeting some people from the Czech Republic! They were very nice and friendly. When I asked if Czech was a difficult language to learn, they replied, "Don't worry, everyone in Prague speaks English!" Hmmm...not a resounding endorsement for an easy languague! I did learn how to say 'hello' in Czech, which is 'ahoy!' (as in Chips Ahoy). Next time you're in Oklahoma in May, check out the Kolache Festival in Prague, Oklahoma. It is a taste of two cultures you wouldn't want to miss!! We've recently started posting videos on YouTube. Check out our recent videos in the column to the left - click any of the video stills to play the corresponding video, or click here to view the entire list on YouTube.